The Ringer – "The Biggest Key to France’s World Cup Run Was Their Smallest, Most Unassuming Player"
"N’Golo Kanté doesn’t jump off the screen in the same way as his teammates—neither for France nor for his club team Chelsea. His diminutive stature (he’s listed at a generous 5-foot-6) compared with the majority of the players surrounding him on the pitch is often jarring, like a fourth grader playing streetball with a bunch of grown men. He is naturally shy, quiet, and unassuming—the “OK” meme guy in the form of a world-class player." "Kanté’s presence on the pitch is itself a paradox: The 27-year-old defensive midfielder is self-effacing to the point of anonymity, but also omnipresent; a common refrain is that he’s got a secret twin, because there’s no way one single player can cover that much ground. The dude does not stop hustling, and I wouldn’t bat an eye if his pregame warm-up was secretly a half-marathon." "The Kanté-specific celebrations continued on the French team bus, with a chant breaking out that praised his ability to shut down Lionel Messi, arguably the best player on the planet, in the round of 16 (“He’s short, he’s nice, he’s the one that stopped Leo Messi,” the Kanté ode goes, translated from French)." "It’s why it makes sense for Kanté’s French teammates to dole out so much praise. Kanté isn’t one to do it for himself, so they might as well become his chorus of hype. In the World Cup, he had 52 recoveries, which led all players and was the most by a Frenchman since 1966, and was also tied for the tournament lead with 20 interceptions. 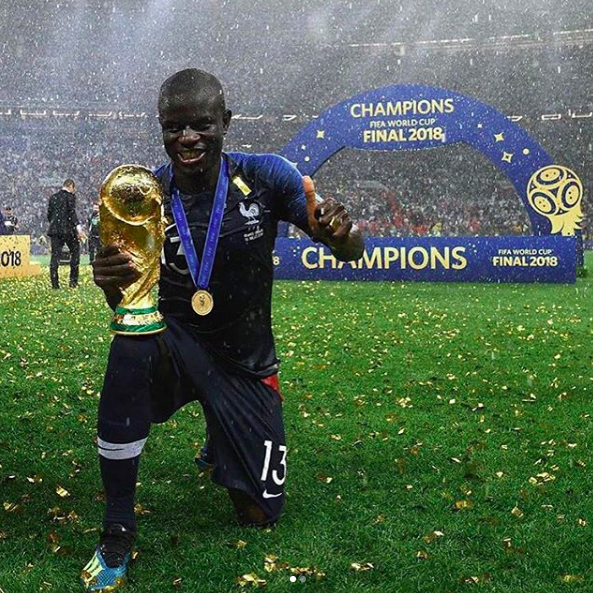 Put simply, Kanté was as integral to France’s World Cup success as Griezmann, Mbappé, and Paul Pogba—and his teammates know it." "After France won Sunday—a game in which Kanté underperformed and was subbed early in the second half, though it was later reported he tried to play through a stomach bug—Kanté was reportedly too shy to ask his teammates to hold the World Cup trophy, so Steven N’Zonzi had to ask them on his behalf. (My heart!) Every aspect of Kanté’s life is just one wholesome meme. Former teammates in France said he’s not interested in nightlife, preferring to go home and rest before more training and matches. He looks happy—even when he’s waiting at an airport."